It's because there's an idea flying around in my plot bunny closet about secrets mothers and daughters don't share. Honestly, when I started this writer's journey I never considered that eventually I would be writing about a mother and daughter in such depth. Secrets can unravel and reveal family situations. Factor in paranormal elements and the stories can take far reaching effects. In the beginning of my writing career, Shayla's mother (Claire) was a bit of a cardboard character standing back against the wall. In my mind she was something like a wallflower; beautiful, but a complete mystery. But merry-go-rounds spin and characters grow. As I sat here in front of the computer startled at finding the replica from my past life (childhood) a memory breathed through the airwaves in my brain. How fitting. Secrets mother never knew. As for my mom? She never knew about the flights of fantasy I took every day during recess. That doesn't mean mothers and daughters don't love each other. Instead, I tend to think that daughters long for their own niche of the world and as we grow our explorations and experiences are a way to set us free. Do those afternoons spent spinning in the world upside down have an effect on my daily life many years later? I'd like to think they do. ;) Those flights of fantasy opened words of imagination and taught me (at school no less ;) that seeing the world through a different perspective could have wonderful results. So while many authors thank past teachers, I can say thank you to Mrs. Muse (yes, real name; 3rd grade teacher) and the playground merry-go-round for magical aspects of this life as a paranormal romance author. You've heard it said, "Write what you know." Well, I suppose that's what I'm doing. Okay, maybe most of the time that's what I do. Flights of fantasy mingled with imagination are absolutely grand. Because, although I've met a human dementer, (characters written into fiction by JKR) I've never personally met a Hade's Hound (my characters). But, perhaps that's a good thing because micro-particles of faery dust are a bit beyond my personal magical capabilities. The memories of our past can be incorporated into our writing in fascinating ways. I guess that's what's meant by write what you know. For myself, the blending of a wildly funky imagination and lifetime events brings together stories that I hope entertain my Readers. I can't help but wonder if mom watches from heaven with a smile. One thing's for sure, little do we realize in our youth that one day we'll look into the mirror and our mother's face will be looking back at us. Who knows, perhaps mom will wink. 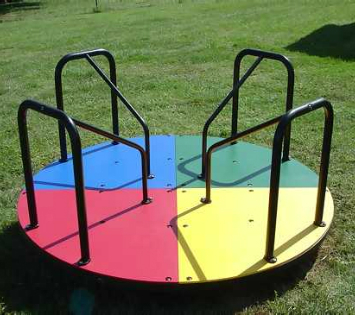 A mediation on memory and the power of things like the playground merry-go-round to take us back down a time tunnel. And I think daughters need to have secrets from their mothers and mothers need to have secrets from their daughters. Thanks for commenting. Yes, this post was a meditation on memory. The memory didn't come through like that until I actually began writing and went searching for an image to compliment the post. Secrets between mother & daughter actually became a gentle thread through two stories: Concentric Circles & Claire: the Lost Fae. It's been a ride of surprises between these characters.